Warm Seasonal Spring Salad & April giveaway! Asparagus is about to come into season for a short scrumptious month only so we had to include this delicious spring vegetable in our April recipe. We are also giving away one of our beautiful blue ribbed terracotta bowls. The perfect serving dish for a warm spring salad! 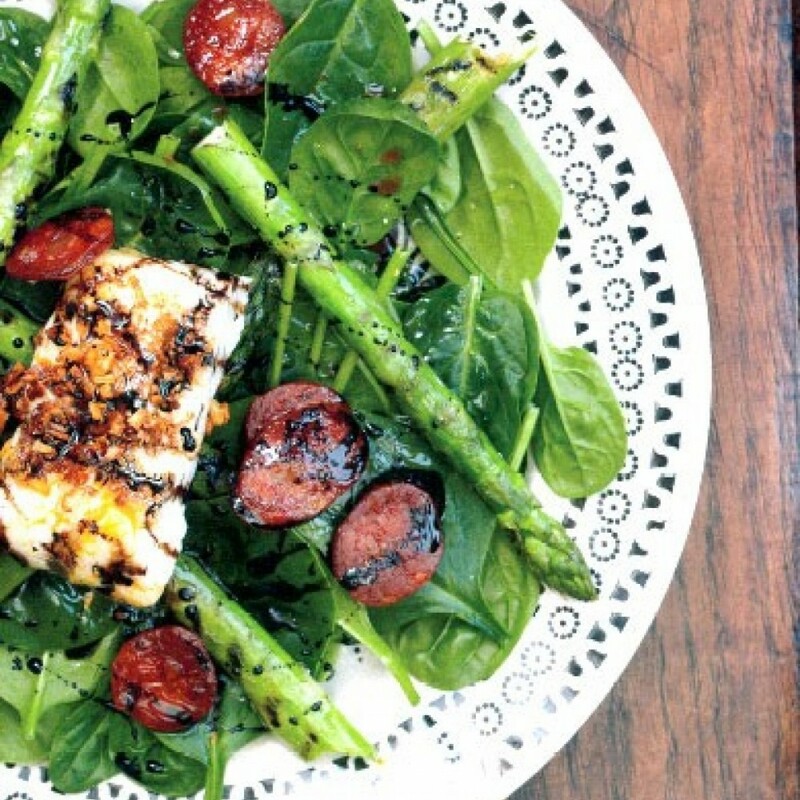 We love this warm spring salad recipe from LEON. Our favourite fast food restaurant! This is a salad that uses up of the kinds of things you find in the fridge during the spring. 1. Divide the spinach between 4 large plates. 2. Lay the halloumi flat in a bowl. Mix the crushed garlic and olive oil together and pour it over the pieces of cheese leaving them for a few minutes to marinate. 3. Put a grill pan over a medium to high heat until it’s very hot. Put the asparagus into a bowl and toss it in a little olive oil until it’s well coated. Season with a pinch of salt, then chargrill the asparagus spears until they are nice and lined or charred. You may want to cut a few in half lengthways before putting them on a grill if they are really fat. Divide the asparagus between the bowls. 4. Now fry the slices of halloumi, pouring the marinade into the pan with them. Cook the cheese until it starts to go golden on the outside. Divide the cheese evenly between the salad bowls, laying it on top of the asparagus. 5. Finally, pan-fry the chorizo in a clean frying pan. As it cooks, it will release lots of its spicy oils. This is a good thing! When the sausage starts to get a little crispy on the outside, divide it up, along with the juices, on top of the salad bowls. 6. Drizzle over any more olive oil that you think might be needed, and finish off with a little salt, lots of pepper, and a tablespoon of balsamic syrup per serving. Our traditional blue ribbed terracotta bowl has a high quality finish resulting in excellent resilience. It has amazing slow cooking properties so perfect to use in your AGA or to serve a warm spring salad! This product is safe for use with AGA's, BBQ's, Gas and Electric Hobs, Ovens, Microwaves, Dishwashers and Freezers.